La charmante ferme côtière traditionnelle du 19e siècle / Cape domine les majestueuses montagnes du parc national d'Acadia et de la baie d'Union River. Accès à la plage privée de Morgan Bay par un joli chemin boisé situé sur la propriété. Le chemin serpente à travers la forêt et est facilement accessible à pied ou à vélo. Newbury Neck se trouve à proximité de nombreux villages côtiers pittoresques et du joyau de la couronne, le parc national Acadia. Des fruits de mer frais au Perry's Lobster Shack, également à Newbury Neck, un port et une plage publique, sont situés à seulement 5 km de la maison. Perry a été placé dans le Boston Globe comme l'un des meilleurs endroits pour acheter un rouleau de homard dans le Maine. Cette maison est dans la famille depuis quatre générations. Parfait pour des vacances d'été en famille ou pour s'évader de l'agitation. Calme et serein et à quelques minutes en voiture des principaux points d'intérêt. Même si nous aimons les animaux de compagnie, nous ne les autorisons pas dans cet établissement. Venez visiter le joyau de la couronne du Maine, Acadia National Park. "Berry Hill" surplombe les montagnes de l'Acadie et l'océan. There was plenty of room for our two families (four adults, four teens) and we all enjoyed our stay at Berry Hill. The house was lovely and the landscaping is gorgeous (even better than your photos)! The view from the front of the house offered beautiful sunrises over the bay. Just loved the property across the road, where there were beautiful wildflowers and endless blueberry bushes! The hike through the back of the property to the private beach was fun (takes about 20-30 minutes) and offered beautiful sunsets. 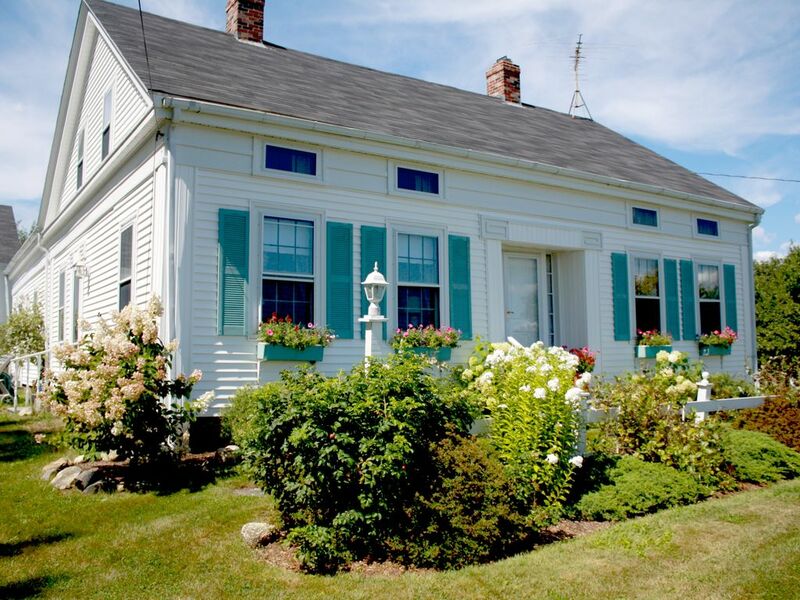 The location is convenient to Blue Hill, Bangor, Acadia and Bar Harbor. The house itself is kept very clean and comfortable. It is an older home, so with it comes a few quirks (dated plumbing, low water pressure), but the kitchen and bathrooms are updated and modern. To be honest, there were just a few complaints from a few in our party. The teens complained about the one small tv in the house (adults laughed at them). Also, the upstairs bathroom wouldn't close all the way (due to the house's age and uneven settling). Other than that, is was just perfect! Thank you for letting us stay at your wonderful home! Our extended family of nine, including three under age 5, absolutely loved our week's stay in this beautiful home. The views were incredible, access to Blue Hill and Acadia -- key in our decision about where to rent -- proved very easy and convenient. A perfect "base" for a visit to the Acadia region. We especially loved the free kettle drum concert in a Blue Hill town park one night! The serenity of Newbury Neck Road can't be overstated, and the location of this exquisite old farmhouse near the end of the road meant very little traffic. Our California contingent got a true Maine experience -- blueberries and all. We just loved sitting on the lawn in front of the house in late afternoon, enjoying the view toward the water while the little ones romped on the grass. The house was beautifully and thoughtfully appointed, and the owners were gracious and understanding at all times. Just a wonderful week! Thank you for your meaningful review! Our hope is to have our guests experience the farmhouse with the same enjoyment of family and friends and love of the areas's natural beauty that we had as a family. It makes us so happy to read these sentiments in your review. Thank you for renting it! Our group of five loved everything about the Farmhouse....beautiful sunrise over the water from the Master Bedroom, spacious 4 bedrooms upstairs. Lovely blueberry picking across the street while walking down to the water, another lovely walk behind the house that brings you out to a beautiful, private cove with beach. The new modern kitchen was 'the best'. The two living rooms allowed everyone to have their own space. Wonderful location!! We hope to return soon!! We've been summering in Maine for 14 years with many of those summers spent on Newbury Neck. This was our first time staying at Berry Hill and we were not disappointed. Everyone in our two families agreed that this was their favorite place we've stayed on the Neck. The house was cozy and comfortable, yet the kitchen new and modern which made feeding hungry teenagers much easier. The blueberry fields going down to the front bay were amazing, we felt like we couldn't not step on blueberries while picking blueberries. The views of MDI and the traffic free Newbury Neck Road made for great morning walks, runs and bike rides. But by far the best part of Berry Hill for us was the great access to Morgan Bay (the "back bay") with the sunsets over Blue Hill and the fabulous kayaking. Seeing the seals, eagles and other wildlife out around Jed's Island always makes Maine special. An Ideal Home Away From Home! Having stayed at other properties on Newbury Neck, I knew that this place would be most ideal for our group of five girls. I toured Berry Hill Farm last year and I couldn't wait to rent it. Everyone was so impressed with how quiet, comfortable and spacious it is. All the original art, pottery, books and family pictures added to its charm. We truly felt like we were coming home after our days' outings. We loved the brand new kitchen! Our bedrooms and baths had everything we needed. The lovely, capable caretaker next door was so friendly and accessible. The setting overlooking Union River Bay having coffee along the lovely garden wall in early morning became a ritual. Happy hour found us there, too, before heading to Perry's Lobster Pier for dinner. We enjoyed the 15-minute walk on the path to the back shore of Morgan Bay. Picking blueberries, then finding them in smoothies was a treat! Newbury Neck Rd. with its limited motor traffic is so ideal for biking, walking, running, even safe enough for strollers and very young new bikers. The vistas along the 8.5 miles are breathtaking. Mutual interests of gardening, art, knitting, hiking, walking and biking took us away for garden tours (Asticou, Thuya, Roosevelt), Stonington (mail boat ride to Isle au Haut), Haystack, shopping (NE and SW Harbors), Blue Hill (David Walker's yoga, Greenspeed juices and smoothies, Blue Hill Co-op and Market, Fishnet, shopping), Ellsworth (Beale's, thrift store, 86This! ), and Bar Harbor, too, for first timers (Shore Path, gifts). All these excursions were an hour or less from "home", even Belfast to buy knitting supplies at Heavenly Socks! It was a fast two weeks. I couldn't wait to get there and I didn't want to leave. I thank the owners for their generosity in sharing this wonderful family home and hope to be able to return. Situé à 15 minutes de Blue Hill et Ellsworth. Acadia National Park, l'une des attractions les plus belles et pittoresques de l'État est à environ 45 minutes du chalet. A 300.00 deposit is required to guarantee your booking and will turn into your security deposit upon arrival. Deposit is returned within 14 days of departure date. Cancellation Policy: A 36 day notice is required for a full refund "less" reservation deposit if staying for 1 week. A 60 day notice is required for 2 weeks or longer. If under this timeframe no refund will be made unless we can book the same exact week(s) as your reservation. A full refund will be made, "less" deposit. PLEASE NOTE: Our weeks run Saturday to Saturday.